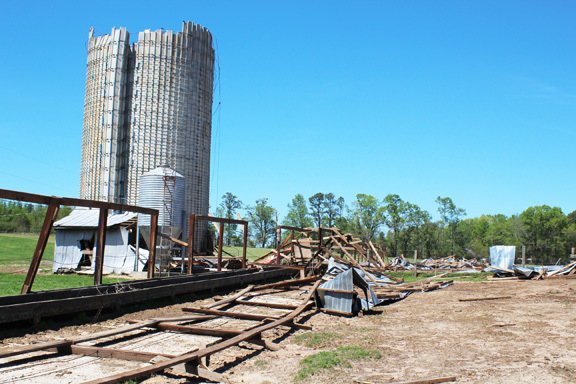 A tornado did damage in the Ridge section of Saluda County Wed., April 5. “The National Weather Service did confirm last Thursday that we did have an EF2 tornado impact Saluda County on Wednesday of last week,” Saluda County Emegency Management Director Josh Morton said. “The last tornado on record for Saluda County was also an EF2 that tracked between Ward and Monetta on March 15, 2008,” Morton said. Saluda County Council began the 2017-18 budget process Mon., April 10, by giving first readings to the school and county budgets. The local portion of the Saluda County School’s $17,642,762 budget is $4,113,933. This is up $246,821 from last year. The county budget currently stands at $12,894,092. The difference between revenue and expenditures is $1,709,359. Two more readings are required before the budgets become final. Council gave third and final approval to an ordinance to execute a quit claim deed on the old Emory School House. Emory Community Club president Becky Clamp said the county gave the school building to the community club 40 years ago, but at that time the Club was not incorporated and did not have non-profit status. The Club has now met those conditions. Second reading was given to an ordinance lowering the rental rates of the hangars at the Saluda County Airport. First reading was given to an ordinance to enable the Coroner’s office to charge a fee for a cremation permit. The Fair Housing Month resolution was approved, and Council accepted a revised purchasing policy for Saluda County. Council approved Grant Coordinator Jill Warren’s applying for a Weyerhauser Giving Fund Request for EMS. The grant will purchase three Stair-Pro chairs for $10,000. The chair assists with patient handling in stairways or in confined spaces. At the beginning of the meeting, Councilman Frank Daniel expressed his appreciation to all who helped when the tornado came through his district last week. Daniel singled out SCE&G, DOT, volunteer church groups, public volunteers, the Road and Bridge Department and the Sheriff’s Office. “We are thankful we all made it through,” Daniel said. Councilman Jones Butler and Councilwoman Gwen Shealy also expressed appreciation to the emergency workers. Councilman D.J. Miller thanked all those who called him last month, explaining the importance of the Brooks & Roston Park to the neighborhood. Chairman Don Hancock also praised emergency workers, also expressed appreciation to EMS, detailing how he had to call an ambulance for the first time in his life last week due to a medical emergency. He said he observed first hand the professionalism of the service, and single out staff members Derrick and Morico, who answered the call. Hancock also praised Recreation Director Paul Ergle for his work. He said 400 youth are participating in Rec spring sports. National Telecommunications Week is celebrated throughout the month of April. Saluda County Sheriff John Perry is declaring Saluda County’s Telecommunications Week April 9-15th. This week is set aside to honor and recognize the dispatchers, heroes behind-the-scences, of the Saluda County Sheriff’s Office. The telecommunicators of Saluda County are responsible for dispatching for the SAluda County Sheriff’s Office, EMS, Fire Departments, Saluda Police Department, Ridge Spring Police Department, and the Coroner. The citizens of Saluda County depend on the expertise, skills, and commitment of our telecommunicators to answer emergency calls, dispatch emergency responders and equipment, and provide moral support to citizens in distress. We encourage the public to take this week to say thank you to the Saluda County Dispatchers. Pictured left to right back row- Ashley Turner (Telecommunicators Coordinator) Carrie Caldwell, Brenda Teague, Amanda Vereen, Tiffany Weed, Sheena Rodgers, Brody Edwards, Roger Bush (assistant Telecommunicators Coordinator) Pictured Left To Right In Front Row- Kanika Brooks, Gloria Tejeda, Charisse Bates, Kade Rodgers. South Carolina American Legion Palmetto Boys State is sometimes referred to as a “laboratory of government”. Boys Staters have the opportunity to run for elected political offices; at the city, county and state levels in a simulated governmental environment. By participation in the political process, they are also afforded the chance to see and hear from representatives in government, influential business and community leaders. The encampment for year 2017 will be held at Anderson University, Anderson, SC. The mission of the Nathan M. Wolfe Law Cadet Academy is to immerse young adults into an environment of structure and discipline. The goal is to provide each young adult with a broad view of law enforcement in South Carolina and give them an opportunity to have hands on experience to guide them through a week of instructions, lectures and hands on training. 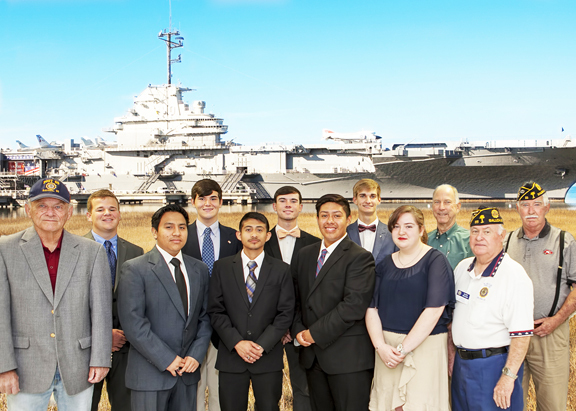 Pictured left to right, front row: Legionnaire Marvin Gootee, American Legion Palmetto Boys State Citizens Roberto Monzalvo, son of Mario Ortiz and Maria Lopez; Hector Ortiz, son of Juana Ortiz; American Legion Boys State Alternate Edgar Zamorano-Morales, son of Jose Zamorano and Isabel Morales; Nathan M. Wolfe Law Cadet Kat Ryan, daughter of William and Harriett Ryan; Legion Commander Post 65 Al Butler. Second row: American Legion Boys State Citizens William Yonce, son of Lauren and Cece Yonce; Joshua Cobbler, son of William Cobbler and Virginia Rushton; T.J. Johnson, son of David and Angela Rodgers; Garrett Lake, son of Elliott Lake and Kimberly Lake; Legionnaires Don Hancock and Dan Guy. Post 65 wishes to thank everyone who supported and had a hand in making this project possible and a reality for these future leaders of our community. Area employers who are hiring are encouraged to participate in a job fair sponsored by the Upper Savannah Workforce System and Greenwood Mall. The bi-annual Upper Savannah Regional Job Fair will be held at Greenwood Mall April 26 from 10 a.m. to 3 p.m. There is no charge to participate. However, available space is limited. Registration ends on April 17 or when all spots are filled. As many as 80-plus employers have attended recent job fairs. It does not matter if an employer wishes to hire one employee or 50. Employers from the Upper Savannah region of Abbeville, Edgefield, Greenwood, Laurens, McCormick, Newberry and Saluda counties will be encouraged to have booths at the fair. Employers from Upper Savannah’s surrounding counties will also be invited. The Job Fair’s new feature this spring is that an invitation has been extended to select high school seniors so that employers have an opportunity to connect with the class of 2017. There are many opportunities for recent graduates to work and go to school. Both Greenwood and Laurens counties have scholarship programs where residents can attend Piedmont Technical College tuition free. People who are unemployed or interested in changing careers are encouraged to attend and visit the employer booths. Job seekers should bring plenty of resumes and are encouraged to dress as if they are going for an interview. There will also be workshops with topics involving careers and how to look for jobs, etc. Information on the job fair is on line at www.upperscworks.com/jobFair.php. For more information, call the Upper Savannah Council of Governments Workforce Development Division staff at 941-8050 or 1-800-922-7729 or your county’s SC Works Center. According Clemson Extension reports, the peach crop in the Ridge was severely damaged by the mid-March freezing temperatures. Some late crop peaches are now blooming, but Henderson said there was concern back in February that they may not have been enough chilling hours for these trees to be successful. The freeze not only affects the crops, but jobs, agriculture services like fertilizing, equipmental rental, trucking, etc. are also hit hard. “It’s a trickle up effect,” he said. Henderson said the loss may be greater than 2007, when South Carolina’s $63 million peach crop was reduced to $15 million. Henderson said there will be some peaches produced. SmartAsset, a financial technology company, recently released its third annual study on property taxes, and Saluda ranked among the South Carolina counties getting the most ‘Bang for their Buck’ on property taxes. 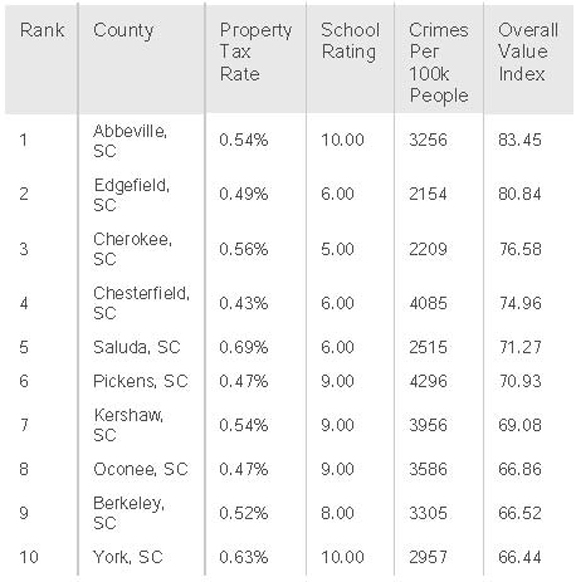 In addition to property taxes, the study analyzed the quality of local schools and the local crime rates to find where people were seeing the most value. 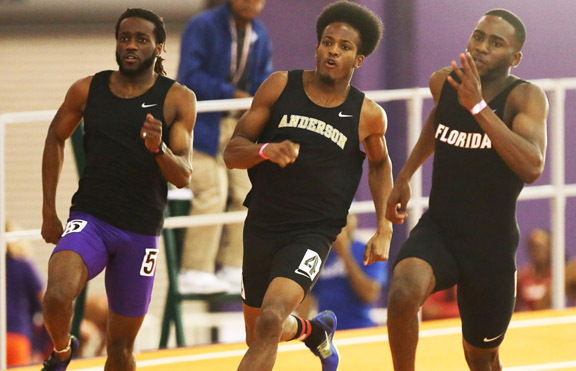 ATLANTA – The Anderson University men’s track and field teams wrapped up competition at the Emory Classic with impressive marks, Saturday at the Eagles’ Woodruff PE Center. Senior Christopher Burton of Saluda posted a NCAA provisional qualifying time by winning the men’s 200 meter dash in a time of 21.41, with freshman Jordan Anderson (22.85) finishing 18th. Burton also posted a provisional time of 10.76 in the men’s 100 meter dash. The Saluda County Sheriff’s Office has identified four suspects in last week’s home invastion at Persimmon Hill and dropped charges against one of the orginally arrested suspects. On Wednesday March 8, 2017 at approximately 12:30am armed suspects entered a residence in the Persimmon Hill Golf Course Community. During the incident, the armed suspects; impersonating police officers, grabbed the two home owners Mr. & Mrs. Danny Tidwell, separated them and placed them in different rooms with their hands bound behind their backs. The suspects ransacked the residence taking anything that was of value along with the keys to one of the victims’ vehicles. The vehicle was recovered in Aiken County along with some of the victims’ personal items. The Sheriff’s Office was able to identify and arrest two suspects; Jerry Kirk of Saluda County and Abin Lee Lowman of Edgefield County as suspects in this incident. Investigators from Saluda County Sheriff’s Office and SLED have been conducting an extensive investigation, reviewing video footage from the surrounding area, interviewing witnesses, and collecting physical evidence. The Sheriff’s Office has been able to now eliminate Mr. Kirk as a suspect in this case even after evidence was located at the crime scene suggesting his involvement. Mr. Kirk was very corporative during this investigation and was released on 03-12-2017. The Sheriff’s Office apologizes to Mr. Kirk, and he was very understanding due to the evidence found at the scene. After further investigation, the Sheriff’s Office has been able to name 3 more suspects in this incident. This makes a total of 4 suspects in connection with this home invasion. Abin Lee Lowman (In-Custody) of Edgefield County, SC; James Christopher Wilson (In-Custody) of Laurel, MD. The Maryland Transit Police pulled Mr. Wilson over on 03-11-2017 for a traffic violation and ran his driver’s license and was advised that the Saluda County Sheriff’s Office had a warrant for his arrest. Maryland Transit Police then advised the Sheriff’s Office of their contact with Mr. Wilson. The Sheriff’s Office at this time sent a detainer and request for extradition for Mr. Wilson to bring him back to Saluda County for this incident. 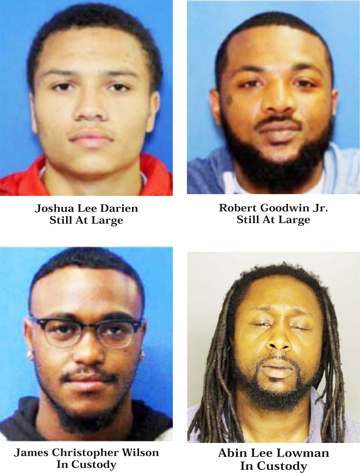 The other two suspects in this case are also from the State of Maryland in the Silver Spring area, and the Sheriff’s Office feels very good about the possibility of having the additional suspects listed below in custody soon. The suspects listed are being charged with and wanted for; Burglary 1st Degree, Kidnapping, Use of a Weapon during a Violent Crime, Armed Robbery, Impersonating the Police, and Grand Larceny. The Saluda County Sheriff’s Office asks if anyone has any knowledge or information about these suspects or their whereabouts to please contact the Sheriff’s Office at (864) 445-2112 or Crime Stoppers at 1-888-CRIME SC immediately. King Academy students, faculty, and staff have been busy with many wonderful events and activities. 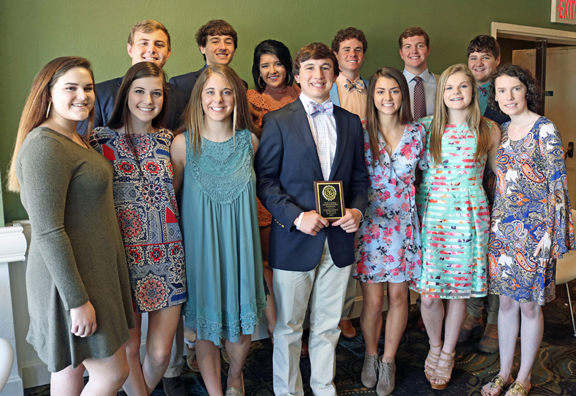 The WKA Student Council recently attended the annual SCISSA (South Carolina Independent School Student Association) Spring Convention in Myrtle Beach and was named the Student County of the Year. The students had a great time together sharing fun and fellowship with each other and other SCISA schools. SCISSA was organized for the purpose of promoting and encouraging fellowship, activities, and interest on a state-wide basis among students in member schools of the South Carolina Independent School Association in academic excellence, in leadership and citizenship, and in good student government. SCISSA sponsors such student activities throughout the year as a summer leadership workshop, a fall conference at the State Capitol, student exchange week, Student Council of the Year, and Honor Society of the Year Awards, and also a spring convention held in Myrtle Beach in March. Officers for the year are elected at the spring convention. Officers from SCISA schools all across the state met to enjoy three days of activities. King Academy congratulates Jackson Parrish who was elected the 2017-18 Recording Secretary of SCISSA. This the seventh consecutive year a WKA student has been elected to the SCISSA Executive Committee. WKA also received the SCISSA 2017 Student Council of the Year. WKA also received SCISSA Student Council of the Year in 2010, 2014, and 2015. King Acadedmy’s Ben Buzhardt, SCISSA 2016-17 President, is congratulated for a great year of service as he passed his gavel to the next SCISSA President. A special thank you to WKA Activities Director Mrs. Paula Edwards for all of her hard work and dedication with the students.